Ilana Sheryl Kloss (born 22 March 1956) is a former professional tennis player, tennis coach, and commissioner of World TeamTennis, since 2001. Kloss was born in Johannesburg, South Africa. Before turning professional, in 1972 she won the juniors singles title at Wimbledon. In 1974 she won US Open juniors singles title. She was the youngest No. 1 player in South African history. In 1973, she won the title in Cincinnati with Pat Walkden, defeating Evonne Goolagong and Janet Young in the final. Kloss was ranked No. 1 in the world in doubles and No. 19 in singles in 1976. That year, she won doubles titles at the US Open, the Italian Open, the US Clay Courts, the German Open, the British Hard Courts Championship, and Hilton Head, as well as the mixed doubles title at the French Open. Linky Boshoff was her most frequent doubles partner. In 1977 she won the Canadian and German championships and the British clay court championship. In 1999 Kloss won the US Open doubles and mixed doubles championship on the 35-and-over tour. In the 1970s she was 12–5 in Federation Cup matches. Kloss, who is Jewish, was inducted into the Jewish Sports Hall of Fame in 2006. She also played in the Maccabiah Games in Israel. Kloss joined the San Francisco Golden Gaters WTT team in 1974, and reached the WTT Finals with the team in 1975. She left the Golden Gaters prior to the 1976 season to team in order to fully participate in clay-court tournaments in Europe which conflicted with the WTT schedule. Kloss returned to the Golden Gaters for the 1978 season. In 1983, she coached the Chicago Fyre to a WTT Championship and was named Coach of the Year. In 1985, Kloss was a player and coach for the Miami Beach Breakers, and became vice-president of WTT in 1987, and executive director in 1991. Since 2001, she has been the chief executive officer and commissioner of World TeamTennis. Kloss is the partner of Billie Jean King, the US tennis player. "Kloss, Ilana". Jews in Sports. Retrieved 5 February 2014. "Seeking Jewish Tennis Players to Represent the United States | Adults-Seniors – News | USTA Florida". Usatennisflorida.usta.com. 22 September 2008. Retrieved 11 February 2011. Chatoian, Ralph (April 23, 1974). "An Analysis of the Pro Tennis League". Daily Independent Journal. San Rafael, California. p. 28. Mulligan, Stephen (2011). "3. 1971–1975". Were You There? : Over 300 Wonderful, Weird, an Wacky Moments from the Pittsburgh Civic/Mellon Arena. RoseDog Books. pp. 62–64. ISBN 978-1-4349-8552-1. LCCN 2011278129. Retrieved August 19, 2014 – via Google Books. Chatoian, Ralph (March 9, 1976). "Golden Gaters Add Some French to Arsenal". Daily Independent Journal. San Rafael, California. p. 24. 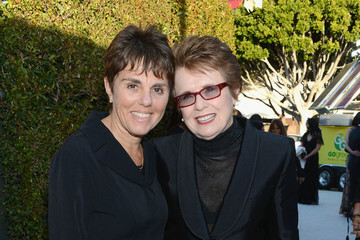 "Portrait of a Pioneer: a Billie Jean King Documentary | TV Show Recaps, Celebrity Interviews & News About & For Gay, Lesbian & Bisexual Women". AfterEllen.com. 26 April 2006. Retrieved 11 February 2011.